The Gospel is the most basic, foundational message of the New Testament, yet it's the most misunderstood. Paul made it simple, using the words "Gospel" and "grace" interchangeably (Acts 20:2 and Gal. 1:6) and saying they both are the means by which we are saved (Rom. 1:16 and Eph. 2:8). As a whole, today's religious system doesn't preach this. Many preachers mix grace with the Law, saying, "Oh, no, we don't want to give people a license to sin." Last I checked, people were sinning without a license! You can't balance grace with the Law. If you do, it won't be the Gospel at all. It takes a supernatural revelation from the Holy Spirit to be able to understand this. Once you do, it'll transform the way you view God, the way you relate to God, and the way you receive from God. My teaching Grace, the Power of the Gospel will help! It will walk you through Paul's revelation of the Gospel and grace, as revealed in the book of Romans. Romans was written to explain the Gospel so that anybody could understand it. If you're going to have a Christian walk that cannot be shaken, it starts with having the proper foundation. You don't need to look any further than the truths Paul laid down in Romans. When you really get hold of these, I guarantee you, you'll be set free from sin, not free to sin.You'll wind up living holier accidentally than you ever have on purpose. You'll serve God out of love stricter and stronger than you ever would have out of legalism. Jesus said you will know the truth and the truth will make you free (John 8:32). It's not truth that sets you free; it's the truth you know that sets you free. But before you can know it, you've got to hear it. Faith comes by hearing, and hearing by the Word of God (Rom. 10:17). That's why I have a lot of materials on this. I have a Bible commentary that will take you through the entire book of Romans, called the Life for Today Study Bible and Commentary: The Romans Edition. It's a hardback book with all the scriptures from the book of Romans along with my footnotes, references, and parallel passages. I also have a book and study guide called Grace, the Power of the Gospel. The book is available in English, French and Spanish. 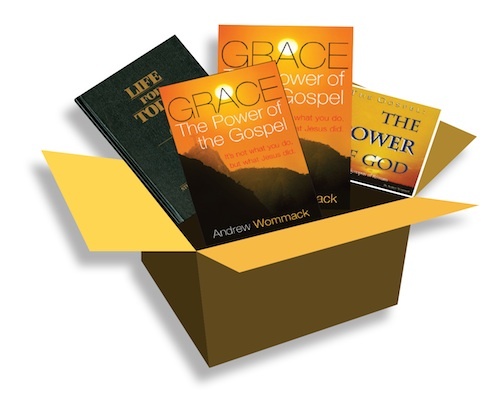 The CD and DVD series for this teaching are titled The Gospel: The Power of God. This month, I'm offering a package deal: the book, the study guide, the Life for Today hardback, and either the CD or DVD series, all for $95 CAD. Order today by going online: store.awmc.ca or by calling our Canadian Helpline: 647-348-2220. These materials will be a blessing to you or someone you know. Your life will be changed!